Superheroes are messy. They may have the best of intentions, but every time they do battle with a bad guy, collapsing buildings are sure to follow. The Parr family knows all about the prejudice against superheroes. Never mind that they conquered the evil Syndrome (as chronicled in The Incredibles). No matter that they just stopped a new felonious evildoer, Underminer, in his subterranean tracks: “Supers” are still illegal. Marketing tycoon Winston Deaver wants to change that. Winston believes that these days, superheroes need to be more than pure of heart and strong of muscle. They need a good PR campaign too. Winston meets with Bob, Helen, and their friend Lucius, aka Frozone, suggesting an all-out media blitz. He wants to reintroduce Elastigirl to the world—and this time, her costume will come with a tiny camera to show the world her derring-do. When it sees all the good that Elastigirl does, all those anti-super laws will collapse like an evil lair made of wood. And the Parr family will be allowed to use its powers freely again. But while Elastigirl swings into action to fight the Screen Slaver, a terrible new villain who can control people via their screens, Bob’s at home, taking care of the kids—helping Dash with homework, trying to lift Violet’s spirits and keeping baby Jack-Jack under control. How much trouble could a little baby be? Well, given that Jack-Jack has more powers than he has control over them, one little temper tantrum just might destroy a city block. Incredibles 2 has its share of standard superhero heroics. Helen’s Elastigirl takes centrestage this time around, stopping runaway trains and saving citizens aplenty. She even makes a superhuman effort to safeguard the lives of villains. That’s praiseworthy indeed. 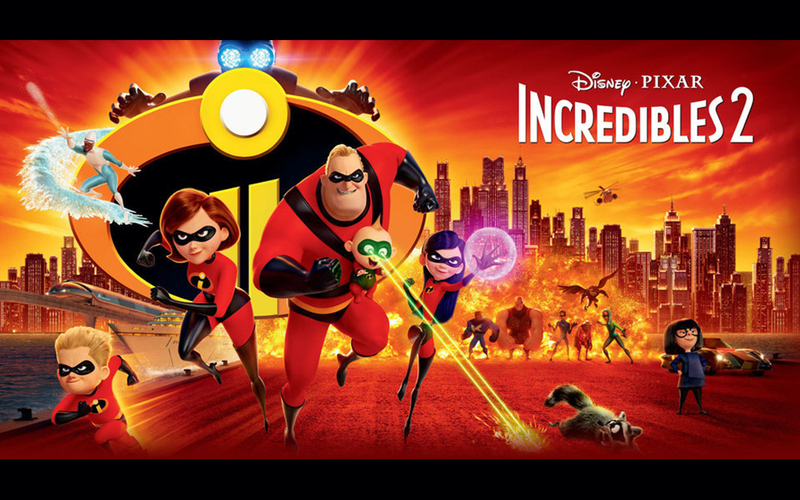 Lots of other superheroes, including every member of the Parr family, get involved, too but Incredibles 2 has a deeper message: That parenting itself is one of the most heroic acts that anyone can engage in. While Helen revels in being a costumed crimefighter again, Bob struggles with being sidelined. Elastigirl is awash in accolades; Mr. Incredible is awash in dirty diapers. It’s tough work, as every parent knows. But he does his best and embraces the challenge with gusto, finding moments of satisfaction along the way. “I’ve got to succeed so she can succeed so we can succeed,” he says. Massive vehicles, from a subterranean drill to a runaway monorail to a huge seagoing ship, imperil lots of people (and sometimes cause significant property damage). Superheroes sometimes sweep people out of the way of danger or, in one case, actually push them out of a helicopter (into a body of water below). They also engage in frenetic fights with villains and other enslaved superheroes: People get slugged and kicked and slammed into walls. One guy tries to crush another with tons of metal. Jack-Jack’s first archnemesis proves to be a raccoon: In trying to stop the critter’s invasion of the family trash can, Jack-Jack unleashes a variety of weapons, including lasers that shoot out of his eyes (and cut down the umbrella that the raccoon is clinging to). Who’s the hero? The costumed crime fighter who saves innocents, stops runaway trains and bops the bad guy in the nose? Or the stay-at-home parent who loses sleep to help his son with his homework? With Incredibles 2, there are no easy answers. Although it is fun to watch and excellent aesthetically, Pixar encourages us to go deeper as we laugh and marvel, cringe and smile. It may not match the majesty of Up or the profundity of Inside Out, but it may make us look at your own world just a little bit differently—and the people we find and love therein.